4-H Delegates learn about Team Nutrition resources as nutrition education tools to take back to their schools and communities. On April 9, USDA Food and Nutrition Service (FNS) asked this simple yet compelling question to nearly 40 4-H delegates at the 2016 National 4-H Conference in Chevy Chase, Md. 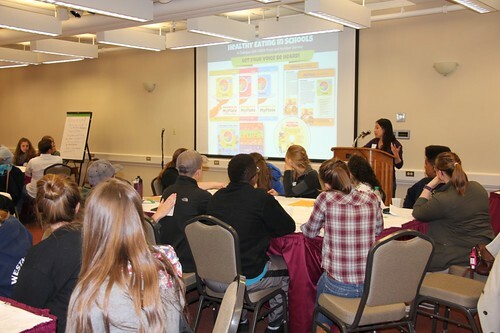 USDA FNS hosted the roundtable session, “Healthy Eating in Schools: A Dialogue with USDA Food & Nutrition Service,” in an effort to give eager student leaders a chance to share their views on school meals and healthy eating. Participants came from all across the U.S. states and territories, from Nebraska to North Carolina, and as far away as Puerto Rico and a U.S. Air Force base in Japan. 4-H delegates were asked a series of questions to gauge their thoughts and experiences with school meals. They responded passionately and expressed excitement about incorporating local foods into their school menu and recommended more fresh fruits and vegetables in their cafeterias. Students also shared their breakfast and lunch preferences and offered ideas to increase School Breakfast and School Lunch participation in schools. USDA will add the students’ unique responses and perspectives to its growing arsenal of feedback and suggestions from schools, parents, and administrators. We frequently use these recommendations to enhance USDA’s Child Nutrition Programs and develop resources and guidance materials for program operators. 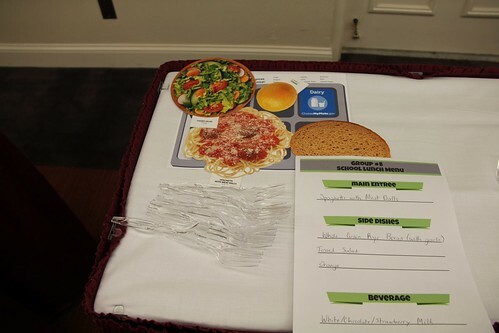 After 30 minutes of thought-provoking roundtable discussions, 4-H delegates took a small break and competed in the “USDA Top Chef School Lunch Challenge.” Delegates were instructed to assemble a nutritious and appealing school lunch tray and menu using a kit of colorful food models from all five food groups. After five minutes of meal planning, students presented their school lunch trays and menus on the “USDA Top Chef” buffet table. Students used forks to vote for their favorites by placing one next to their top choice. The winner with the most forks was an oldie but goodie: spaghetti with meatballs. However, we would like to give a shout-out and honorable mention to a very creative menu: “Ir’roast’istible Beef with Local Corn on the Cob, Sweet Nectarine, Whole Wheat Roll, and Legend ‘Dairy’ Milk”. We are excited to see what will transpire next as students bring their tools and ideas back to their school cafeterias. This 4-H youth roundtable session was yet another way USDA is offering technical assistance, listening to school meals program participants, and promoting a healthier school environment. USDA is committed to enhancing our school meal programs and maximizing benefits for meal program participants across the country. We will continue to gather feedback from our hungry and active end-users. Students have a voice, and USDA is listening.